In the days before home theater receivers and surround sound, stereo was the main listening option for both music and movies. One feature that most stereo receivers had (and most still have) is an A/B speaker switch. This allows a stereo receiver to hook up to another set of speakers so that they can be placed in the back of the room for a more room-filling sound or in another room to make listening more convenient without having to set up a second system. Although an A/B speaker switch added some listening flexibility, the limitation is that you can listen only to the same source that is playing in the main room. In addition, the power going to all your speakers is reduced because of the signal splitting to four speakers, rather than just two. With the introduction of home theater receivers, which provide the ability to power five or more channels simultaneously, the A/B speaker switch idea was upgraded to a feature that is referred to as Zone 2. On a home theater receiver, the Zone 2 feature allows a second source signal to be sent to speakers or a separate audio system in another room. This adds more flexibility than just connecting additional speakers and placing them in another room, as with an A/B speaker switch. Unlike a B speaker setup, the Zone 2 feature allows control of either the same as or a separate source from the one you're listening to in the main room. For example, you can watch a Blu-ray disc or DVD movie with surround sound in the main room while someone else listens to a CD player, AM/FM radio, or another two-channel source in another room at the same time. The Blu-ray disc or DVD player and CD player are connected to the same receiver but are accessed and controlled separately using the same remote. For receivers that offer a Zone 2 option, the remote or onboard controls allow input selection, volume, and possibly other features related exclusively to Zone 2. The Zone 2 feature is usually limited to analog audio sources. However, as you move to higher-end home theater receivers, the Zone 2 option may accommodate analog video with digital audio and streaming sources as well. Some midrange and higher-end receivers also provide HDMI audio and video output for Zone 2 access. In addition, some higher-end receivers may include not only a Zone 2, but also a Zone 3, and in rare cases, a Zone 4 option. The Zone 2 feature, if available, comes in two flavors: powered or line-out. Powered Zone 2: If a home theater receiver has speaker terminals labeled "Zone 2," you can connect speakers directly to the receiver and the receiver will power them. When this option is available on 7.1 channel receivers, however, you cannot use a full 7.1 channel setup in the main room and use the Zone 2 option at the same time. In most cases, the same speaker terminals are used for both the surround back channels and the Zone 2 function. On the other hand, some receivers provide separate speaker connections for both a 7.1 channel and Zone 2 setups. 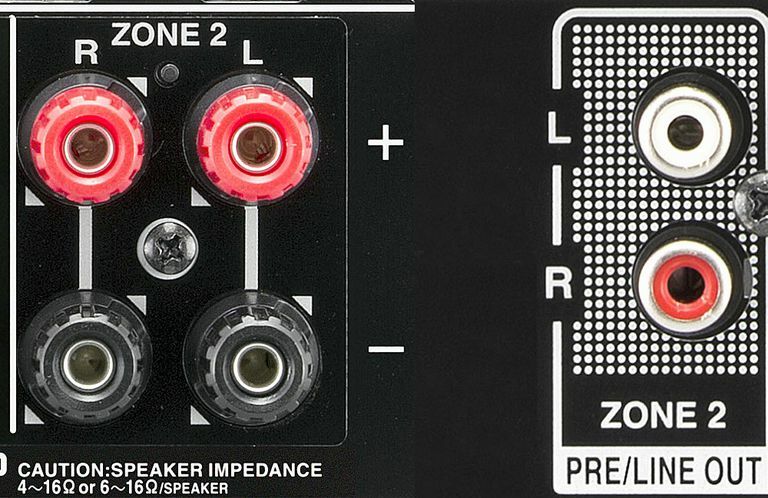 With this arrangement, though, when Zone 2 is activated, the receiver diverts the power normally sent to the sixth and seventh channels to the Zone 2 speaker connections. This means that, when Zone 2 is on, the main zone system defaults to 5.1 channels. Line-Out Zone 2: If a home theater receiver has a set of RCA audio outputs that are labeled Zone 2, you will have to connect an additional external amplifier to your home theater receiver to access this feature. The added speakers are then connected to that external amplifier. Because 7.1 channel receivers that include line-out Zone 2 capability enable use of the full 7.1 channel option in the main room while still operating a separate Zone 2 with external amplifiers, they offer more flexibility. In some receivers, both powered and line-out options are available. However, a specific home theater receiver might have only one of the above Zone 2 access options. Another setup option you can try with Zone 2 is having separate surround sound and stereo setups in the same room, instead of setting up a speaker system in another room. For example, many prefer serious music listening using different speakers (and a different amplifier) than those used in a surround sound speaker setup. Taking advantage of the Zone 2 option, a user can set up separate speakers (or a separate amplifier/speaker combination) for dedicated stereo listening in the same room as their surround sound setup. The user would just switch over to Zone 2 when listening to music only for a CD player or other compatible Zone 2 source. Since the main zone and Zone 2 setups are the same room, using both at the same time is not advisable. However, you might do this if you like a more dedicated stereo listening option but don't want to set it up in another room, or don't have another suitable room for a Zone 2 setup. The Zone 2 feature on a home theater receiver adds flexibility by allowing you to send the same, or a separately connected, source from your home theater receiver to a speaker system or amplifier/speaker set up in the same or another room. If you want to take advantage of Zone 2, make sure the receiver you are considering offers that feature, and check what specific signal sources can be sent to a Zone 2 setup. In rare cases, you might find a two-channel stereo receiver that offers both an A/B speaker switch option using speaker connections and a Zone 2 line-output option.